What does that mean in our everyday life or for our kids? It means every little thing that most people tune out becomes very interesting to someone with the symptoms of ADHD. It means you can remember a memory from a year ago but can’t recall what you just studied the night before. It means sitting down for an extended period is more akin to a punishment then a chance to relax. More and more children (up to 7%) and adults are being diagnosed with ADHD or Attention Deficit Hyperactivity Disorder. Is it a true developmental disorder or a naturally occurring set of behaviors that our new system and culture does not tolerate? This blog/article is not meant to challenge those tough questions but to provide you information that is currently available. How do they measure ADHD? Which part of the brain does it impact? When they scan the brain, it appears there’s a lack of electronic impulses in the frontal lobe. Notice in the scans to the right, the control group participating in a typical frontal lobe activity (e.g. short term memory, focusing, retelling a story, etc.) has a lot of activity (notice the “i” shaped features signaling brain activity in frontal lobe). 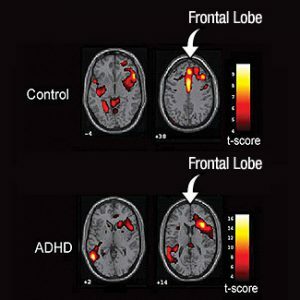 But when the person whom has symptoms of ADHD is given the same task, the frontal lobe activity is much less and seems to be shifting the function to a temporal lobe. This could be a problem for that person because the frontal lobe is our game controller. It operates our executive functioning. What are our Executive Functions? Delays in these executive functions exposes why people with symptoms of ADHD have trouble in relationships, work and school.